First made in the 50s by the Eagle Lock Company, this unique design won't leave dents in your caps. What happens when you get into craft beer? You start caring about how you get into craft beer. First made in the 50s by the Eagle Lock Company, this unique design keeps its vintage-industrial look, and takes caps off in a way that doesn't leave dents or scratches in the middle (thanks, secret grippers!. A conversation-starter and party-starter, the opener is a thoughtful gift for the person who only serves the best brew to their crew. Made from zinc alloy and stainless steel in China. 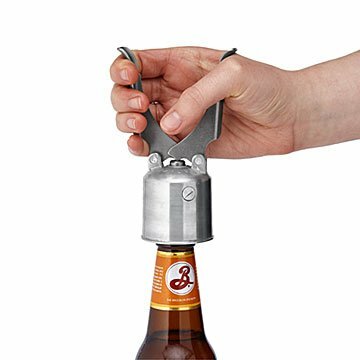 If you have to keep a bottle opener handy, this is the one you want. It's attractive and a great conversation piece. Perfect addition to our barware. Got this for my Father-in-law for Christmas. Its a nice, functional, unique gift.